Archaeologists working in the borderlands of northern Mexico have uncovered a camp used by ancient hunters as much as 10,500 years ago, revealing insights into some of the earliest human history in the Greater Southwest. On a ranch near the Santa Maria River in northern Chihuahua, researchers have unearthed more than 18,000 artifacts, including thousands of stone flakes, cores, and hammers, along with 370 projectile points, and a dozen stone ovens. But the most surprising find has been the grave of a teenage girl, who was interred among the rocks, alone and unadorned, some 3,200 years ago. Her remains, researchers say, may help unlock the history of the people who brought agriculture to this arid region, and who were the first known farmers of corn in the Chihuahuan Desert. 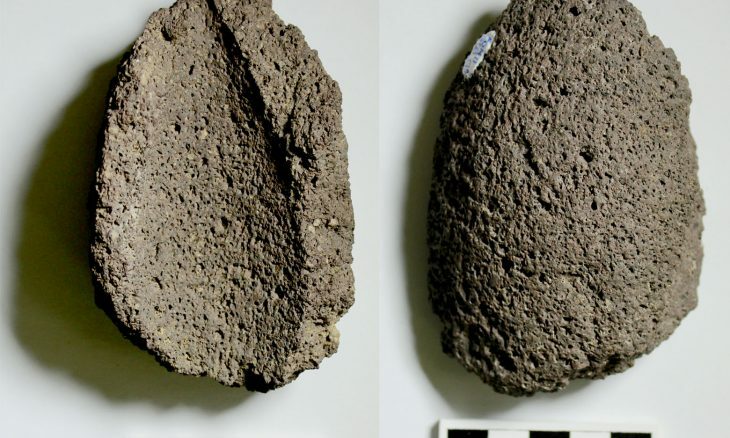 “The importance of this find is in knowing more of the early steps of humans on this land, to remind us that whatever the geographical characteristic of this region, humans were able to make a living here, to make this region their home,” said Dr. Emiliano Gallaga, who led the research. Gallaga and his colleagues discovered the site while investigating a patch of desert about 70 kilometers [45 miles] south of the New Mexico border that was being developed for a solar energy plant. “At this point the [energy] company had two options: leave the areas of the site untouched, or pay for a salvage project,” said Gallaga, a research fellow with Mexico’s National Institute of Anthropology and History (INAH), which conducted the research. 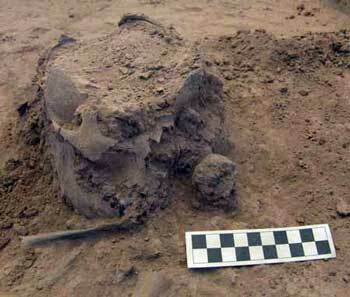 After investigating nearly 7.5 acres, the researchers found no evidence of any structures and also no ceramics. But they did uncover 12 stone ovens, along with an incredibly dense concentration of tools and stone fragments, suggesting that the site had been used as a kind of tool-making camp intermittently over thousands of years. The camp consisted of several separate working areas, each scattered with a variety of stone chips, cores, and tools. 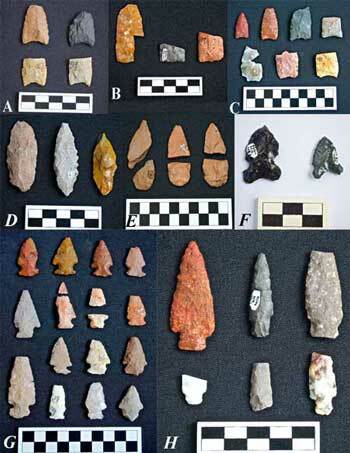 In all, 18,488 artifacts were recovered, including hundreds of stone points that were fashioned in recognizable styles that date back more than 10,000 years. In all, he said, the 370 points represent 30 different styles, spanning the Paleoindian and Archaic periods. But the most striking find came when the team turned its attention to a heavily eroded slope. “When we were doing the surface collection, we noticed an interesting feature on the surface: a circle of bones coming out,” Gallaga said. “We thought it could be a turtle shell, but we decided to make an [excavation] unit there, just in case. About 20 centimeters [about 8 inches] below the surface, the researchers uncovered the remains of a girl between 12 and 15 years old. She was buried in a flexed position, with no grave goods or other offerings. Radiocarbon analysis of three of her teeth revealed that the burial dated to around 1360 BCE — a significant date range for Gallaga and his colleagues. That’s because, about a day’s walk from the Santa Maria ranch sits an even more impressive site from the same period. A hilltop settlement known as Cerro Juanaqueña, it’s the most important site of its kind in northern Chihuahua, Gallaga said. In the late 1990’s, archaeologists investigated Cerro Juanaqueña and found more than 400 basalt terraces built onto its hillsides, some of them likely used for farming, and about 100 stone circles thought to be the foundations of houses. But, most importantly, archaeologists also found the remnants of corn dated to 1150 BCE — the earliest evidence of maize ever found in Chihuahua. No human remains were found at Cerro Juanaqueña, but if the girl discovered at Gallaga’s campsite was a member of its culture, she could hold a wealth of data about the high desert’s first known corn farmers. 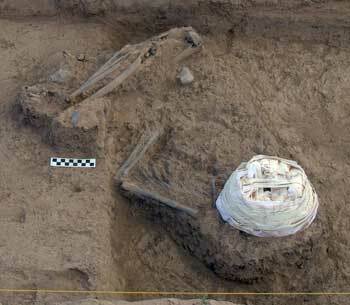 “It’s possible that this burial could have some relation with Cerro Juanaqueña … that was occupied at the same time of the burial,” Gallaga said. Still other studies will focus on the ratios of strontium isotopes found in the girl’s teeth, which can shed light on where she was born and raised, as well as her diet. “[Other archaeologists] would like to see if the young girl ate corn, which could be a good indicator that this site is related to Chihuahua’s Archaic Cerro [Juanaqueña] tradition,” Gallaga said. “Due to the relevance of the findings, we recommended to INAH Chihuahua that they could give the permission for building the solar plant in the area, with the exception of the [camp] site,” he said. won’t the native Americans be intent on quickly burying her? With all the respect for the American Indians, but those regulations do not aply in Mexican Soil.